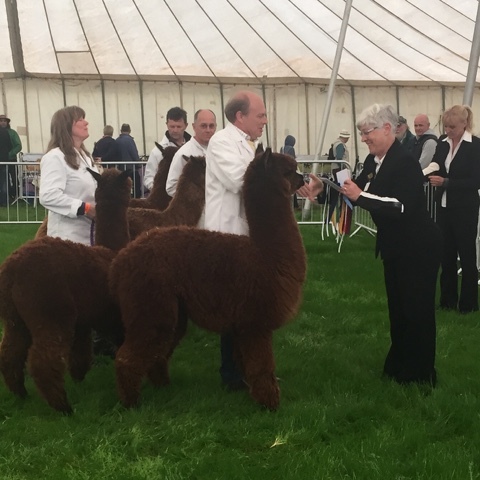 Splendid Thursday and Friday this week at the Devon County Show in Exeter where Shirley was judging the alpacas and I was commentating on the proceedings and keeping exhibitors and public informed on the wonderful world of Alpaca. The weather heals off both days from being disastrous with a short break for rain on the Thursday when we went inside for a couple of hours. All in all the rain threatened throughout as it does in an English Summer but it never really materialised and a good crowd enjoyed the proceedings throughout. Jo Bridge was apprenticing with Shirley and together they kept up a cracking pace to get through 170 entries over the two days. 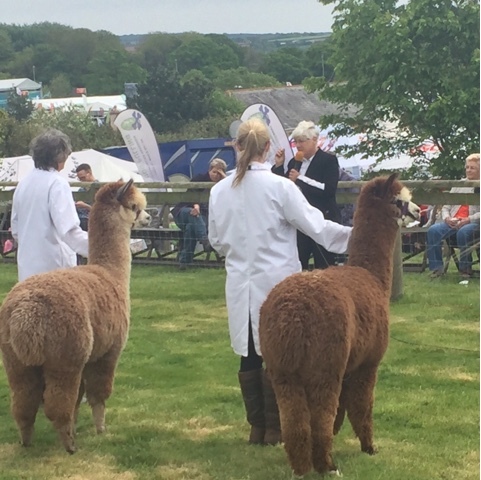 It was a great two days of Alpaca fun and the standard of alpacas seemed very high with a very large Suri entry making my job of keeping the 'rabbit' going fairly easy. 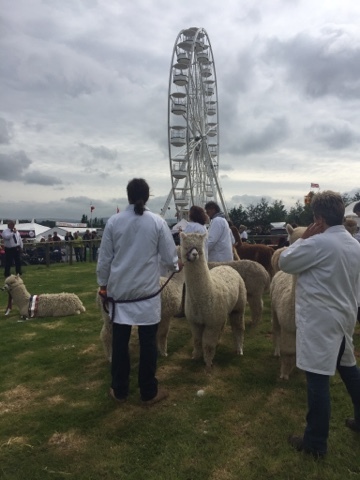 Great crowd, great setting, fabulous alpacas and a great sense of camaraderie from the exhibitors makes this an unmissable event. 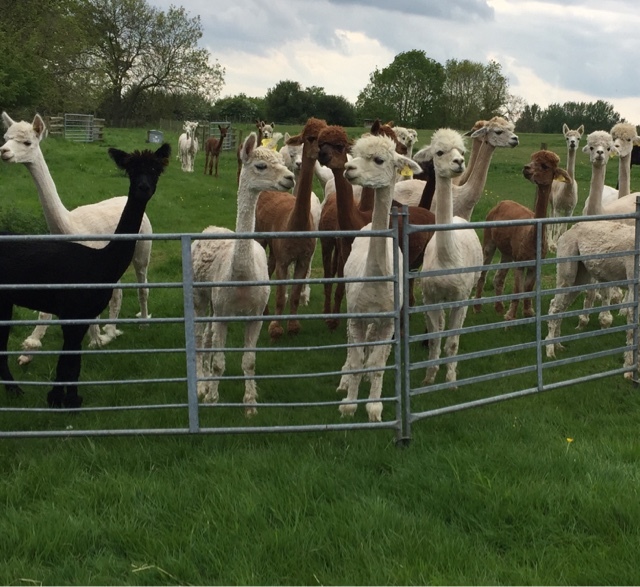 Just look at the setting, a permanently fenced show ring, two huge back up marquees to house the alpacas and to keep the ring going in adverse weather. All this next to the main show attraction the Devon Eye! What's not to enjoy?? What a showcase for our magnificent creatures. Congratulations to all the winners, commiserations to those who didn't get placed. 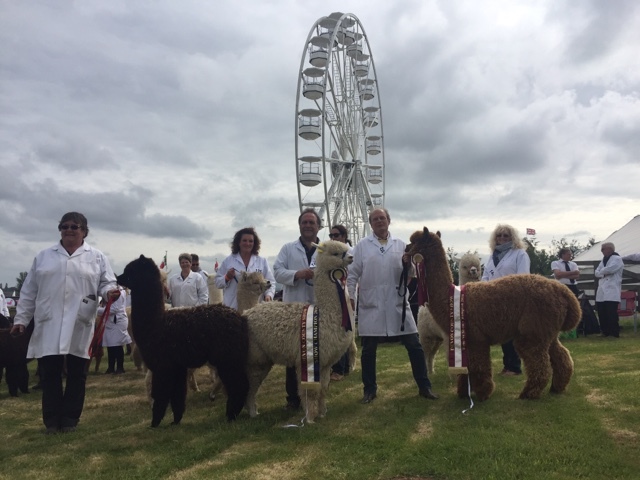 Well done Mrs TOFT Alpaca judge and her apprentice from....Suffolk! That's all it takes to shear an alpaca- walk it from the pen, lift it onto the table, tether back and front legs, stretch and secure as someone holds the head. Once settled, toe nails are cut and shearing begins . Shear one side then roll the alpaca and shear the other. Check teeth, administer vaccination and wormer if appropriate then release. 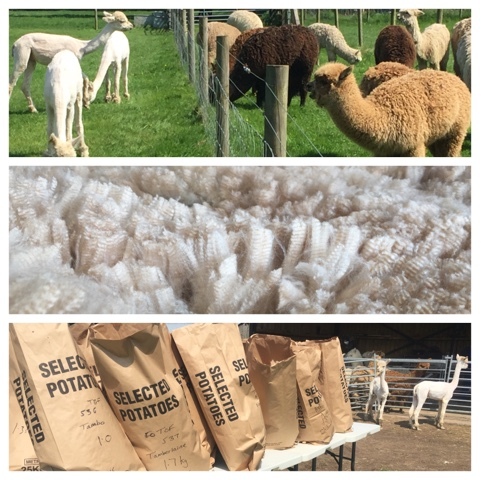 Meanwhile the useable part of the fleece, which is the majority, is taken from the shearing table and placed on the sorting table where three other people rapidly skirt and grade the fleece to its relative batch in less than six minutes. 6 min is all it takes to transform our stunningly beautiful 'teddy bears on legs' into ' Pink Panthers'. Now we must wait 3-6 months for the 'look' to return whilst enjoying the comedy of our Panther romping around inthe sun enjoying the freedom of their summer clothing. Why do we leave the top knots on? Because it's cute- shave the topknot and they look a bit like 'Old Nick'. 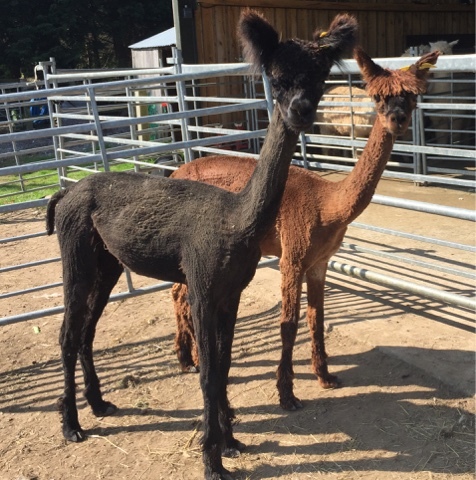 You can't sell an alpaca with a shaved topknot! 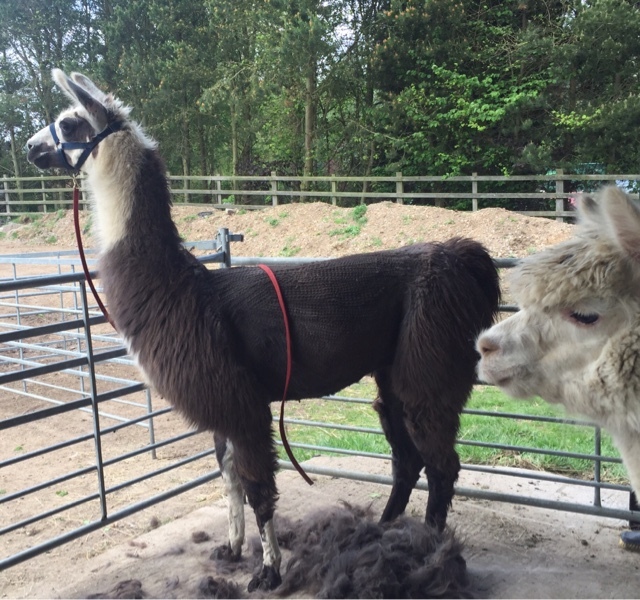 Archie the TOFT Llama got his annual haircut yesterday as the final alpaca to be sheared at this sitting. 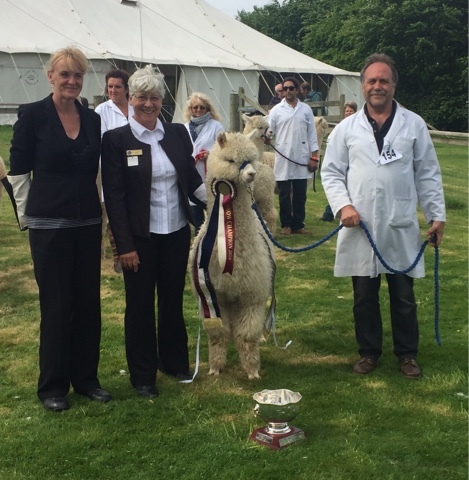 Archie is sheared standing up and that cut is called a Barrell cut which apparently is all the rage in the Lllama soirees at the moment... Honest! 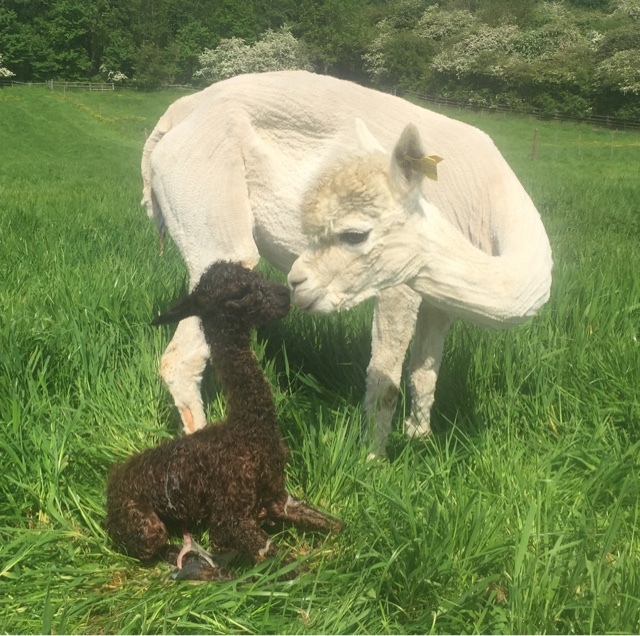 Archie has one main function at TOFT and that is to demonstrate the difference between a Llama and an Alpaca which he does magnificently. 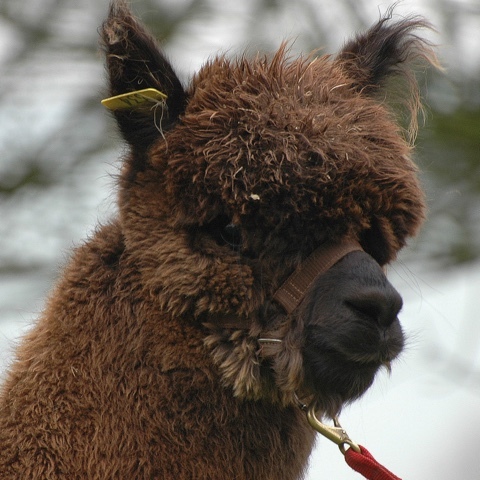 As you can see he is... A foot and half taller, has big curved ears like the handles of the European Cup, his tail is permanently cocked at a jaunty angle and his head is much larger and more accentuated giving him a haughty arrogant look which is not as submissive as the alpaca. Job done.. Well done Archie. Well that's done, we knocked off shearing the last alpaca about 1 ish, having made good progress since 6.30am. Good breeze over night ensured all were dry this morning. 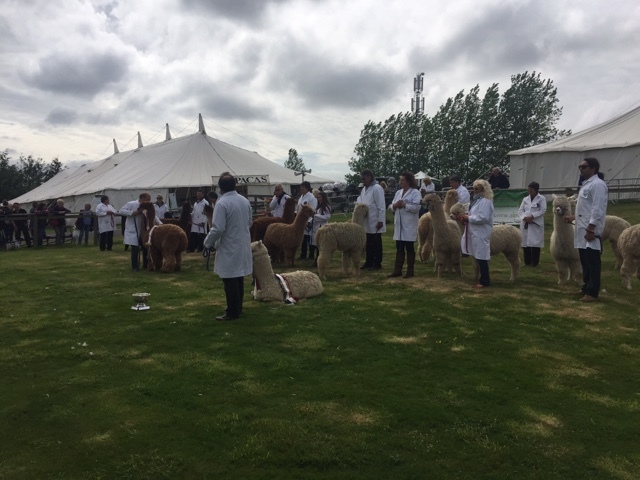 We got a good start and Freya and Linda had al the remaining alpacas in their place adn running smoothly through the holding pens ensuring the shearer kept moving without a break throughout. 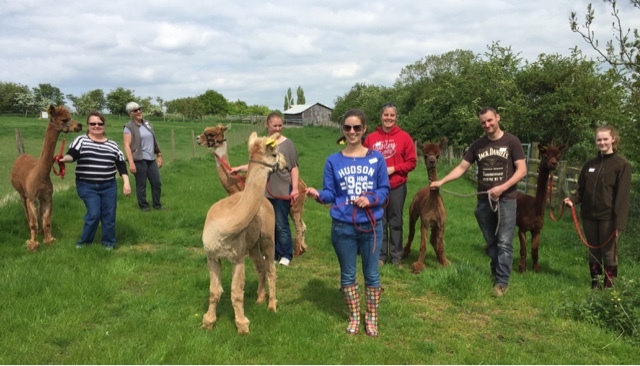 A big thanks to all who took part in rounding up, shearing , sorting, grading and tidying up. Couldn't have done it without you. Go get showered and enjoy! All there is to do now is clear up. For the rest of the summer we live with the 'Pink Panthers' until the regrowth rounds them back into cute Teddies. Mind you with those ears now their main feature these girls look pretty cute! 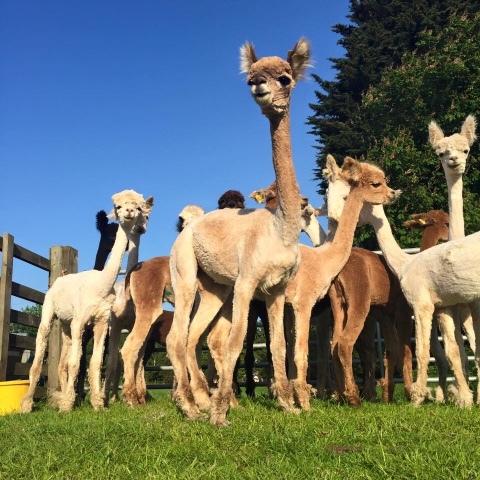 We begin shearing yesterday afternoon having shredded up a number of alpacas overnight Tuesday for an early start. Unfortunately the weather was against us for most of the day. 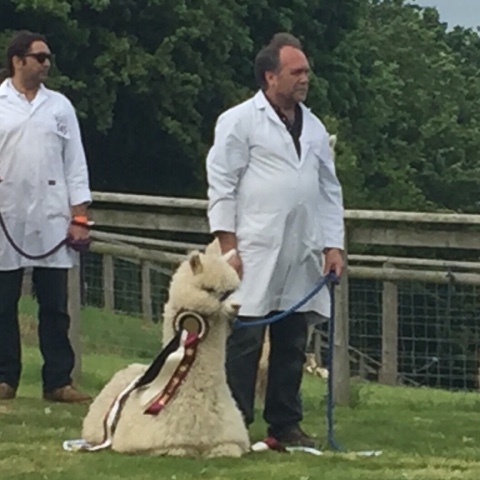 So as we can't shear wet alpacas we delayed starting until the afternoon. In between showers we had just enough dry to get through about 40 before rain stopped play. We were all up at the crack of sparrows this morning to find our shredded alpacas a bit damp to kick off straight away. We got them outside in the wind for an hour while we all tucked into bacon sarnies and Bobs your Uncle we got the table busy by 8.30am. 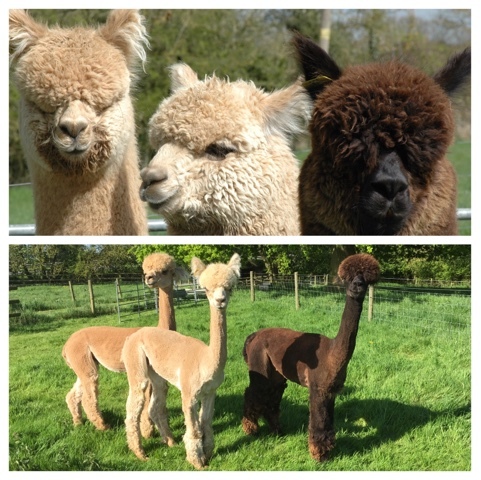 The weather has been perfect today with bright sunlight and a gentle breeze to keep the alpacas dry. Finished about 7.30pm after a full on day. 'Twas ever thus! Dinner now then bed. We shall all get up at the crack of sparrowfart and do it all again tomorrow. Bit of a shocker the other day. 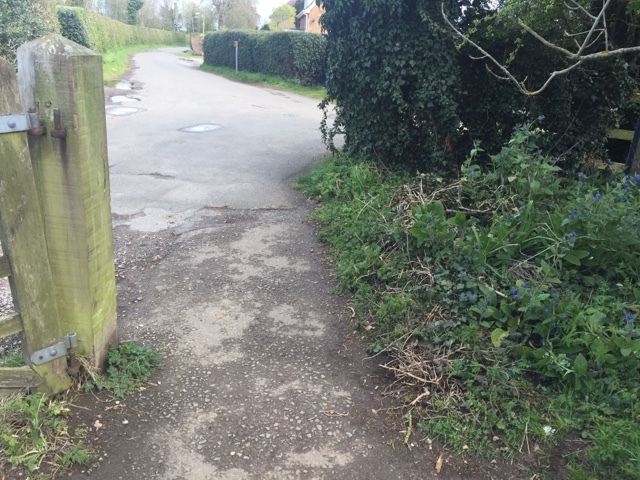 I went up to the Rye Hill Farm entrance to our place where the Sustrans cycle track comes through towards the Reservoir to find that a gate had completely disappeared. Gate and post were gone leaving a large gap where a wooden pedestrian gate used to hang. On enquiry it turns out that Linda had noticed this omission a month back and Shirley swears the gate was gone before that. Well I never. No one found it remarkable enough to inform yours truly. 'Twas ever thus. TOFT Poo Picking Machine- Only thing missing is the engine. Runs on normal fuel intake with cake and coffee supplement! Seriously I always smile when I pass these rigs. We have them placed all over the farm in strategic positions for clearing the hard standings, small home paddocks, isolation paddocks etc. 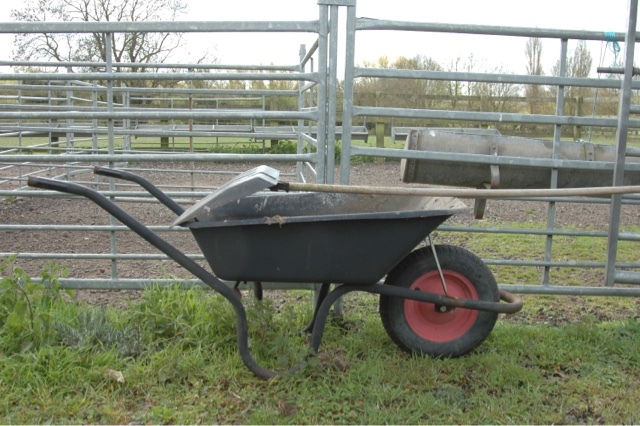 A £40 wheelbarrow and a £7 snow shovel. Yours truly has been known to invest in several snow shovels in July and August when he sees them in the sales at less than £7 outside small DIY outlets and garages. Well, we just can't have enough of those boys floating around to shovel up the Alpaca poo. Simple but, oh,so effective. After almost 20 years of picking alpaca poo we still haven't found anything better than a cheap plastic snow shovel for scooping up the 'beans'. Of course we do have an old Wessex sweeper/scarifier that works off the PTO on the tractor for cleaning the bigger paddocks. 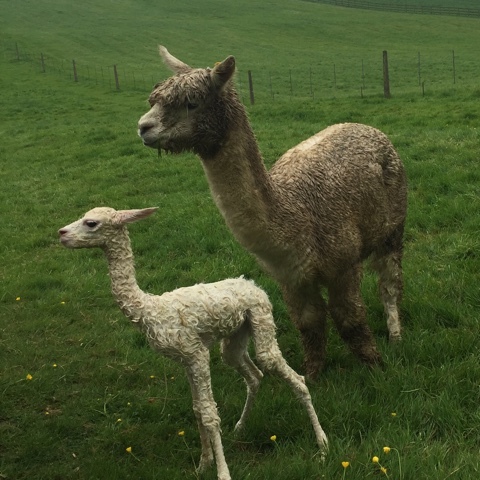 I mean lets get real, there's almost 70 acres of alpacas at TOFT !